Srikalahasti Temple of Andhra Pradesh is one of the famous Shiva temple in South India. Here you can get all the detailed information about the famous temple of Andhra Pradesh. Read the full article to know more about the Srikalahasti Temple of Andhra Pradesh. Srikalahasti Temple of Andhra Pradesh is one of the famous Shiva temple in South India. 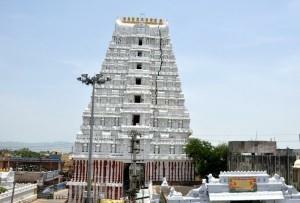 This famous Srikalahasti Temple is located at Srikalahasti town of Andhra Pradesh. It is said that "Kannappa" who was one of the Saivite Nayanars was almost ready to give his both eyes to cover the Lord Shiva Linga from blood flowing. Just at that time Lord Shiva appeared and stopped him and blessed him and give him "Mukti". This famous Srikalahasti Temple of Andhra Pradesh is situated just about 36 kms from the famous Tirupati temple of Andhra Pradesh. 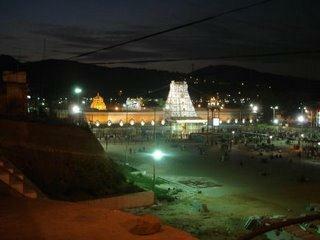 This Tirupati temple is only one temple which is for the God of Wind. The famous Srikalahasti Temple of Andhra Pradesh is also related with "Rahu and Kethu". The beautiful Suvarnamukhi river passes at the left side of the temple. It seems as this great river washes the left wall of the temple. In side the temple there are two steep hills are present which are known as "Sripuram" and "Mummidi-cholapuram". In this temple the Lord Shiva Linga is there to represent the Element of "Vayu" of the wind. This famous temple of Andhra Pradesh is also commonly known as "Dakshin Kailash". This famous Srikalahasti Temple of Andhra Pradesh is one of the most attractive and wonderful Lord Shiva Temple of India. The architectural style and design of this Srikalahasti Temple is very wonderful.Thereis a tower is present at the entrance of this Srikalahasti Temple of Andhra Pradesh which is about 120 feet high. The most amazing thing of this temple is this temple is carved out from a huge stone hill. The temple or the design of the temple was first made by Pallava dynasty. In that time the kings of Chola and Vijayanagara were also helped for this temple. On 10th century this famous Srikalahasti Temple of Andhra Pradesh was completed by the Chola kings. But the walls of the temple and the 4 gopurams were constructed by Sri Veera Narasimharayar in 12th century. The entrance tower and Pillar were made by Krishnadevaraya who was the king of Vijayanagara in the year 1516. In the year 1912 Mr.Ramanathan Nattukkottai Chettiyar invested about one million dollars to redevelop this famous temple of Andhra Pradesh. The name of the temple is Srikalahasti Temple as there is also a very good and wonderful reason behind this. Many years ago there were three staunch devotees of Lord Shiva. Those are a Spider or which is locally named as "Sri", a Snake which is locally named as "Kala", an Elephant which is locally named as "Hasti". The Elephant used to wash the Shiva Linga and makes that clean. The spider makes web around the Shiva Linga to protect from any damage and the Snake placed its precious gem on the famous Shiva Linga to adorn. As Sri, Kala and Hasti were the staunch devotees of Lord Shiva, So according to there names the temple is known as Sri-Kala-HAsti of Srikalahasti Temple. The famous festival of Srikalahasti Temple of Andhra Pradesh is Mahasivaratri. On that festival many peoples come to this famous place of Andhra Pradesh. Thus this famous Srikalahasti Temple of Andhra Pradesh becomes one of the famous tourist place in Andhra Pradesh. Thanks for providing the article for us. We are doing chennai to kalahasti tour package to you. We will provide the customers with some awesome deals and the some packages service are provided at discounted prices through these packages. Many of the travel agents don’t allow liquor, smoking and non-veg food in Chennai to Tirupati travel times. However, it is more important to know the terms and conditions that you need to follow, in the holy land of Tirupati before paying for the Tirupati Kalahasti tour package from Chennai.